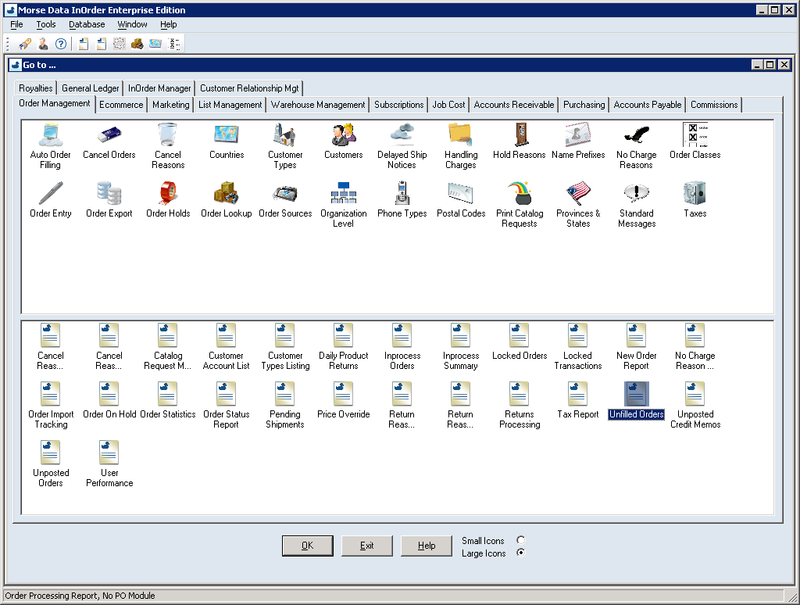 As an Enterprise Management System, InOrder has many valuable features. One of my favorites is the Customer Service module because it has everything Customer Service Representatives need to do their jobs – all in one place. Whether it’s entering orders and quoting prices, calling customers and keeping track of those calls, checking loyalty points, active subscriptions, and contact history for a customer, or sending a letter, Email, or even a Fax, all these things – and more – can be completed from InOrder’s Customer Service. All the CSR has to do is enter the information on its tab. Want to know the customer’s birthday? Check a custom tab. Need to jog your memory about yesterday’s conversation? Check the History tab. Shipping, taxes, payments, it’s all here, right at your fingertips. And while CSRs are taking care of customers, InOrder is busy supporting sales and marketing efforts, like recommending items for cross-selling and up-selling, associating orders with promotions or mailing lists, and tracking order origins. You wouldn’t expect such a powerful tool would be so easy to use, but it is. What’s your favorite feature? How does it help you do your job? Adding a new ERP system to your business is like moving into a new and bigger house. Let’s say you have a spouse and two children and you’ve been living in a small two bedroom “starter home.” The house is fine – it’s a little tight, but with tweaks and efficient use of space, you and your family live there comfortably enough (although it would be nice to have a second bathroom!). Then, you learn – uh oh! – you’re having twins. Now you need a bigger house, so you make a list of all the things you want in your new house because hey, since you have to move, you may as well get what you really want. You house hunt and find the house of your dreams – but before you move in, you decide to save time and paint the walls and hang the art exactly the way you have things in your current home. Why? Because it works, so why change things? Then you move in – and realize the paint colors and the art really don’t work in your new house, but now you’re stuck because cash is tight, you’re dealing with your new twins, and you got a promotion at work. You’re crazy busy and a little broke. You don’t have the time or money to change things. But you sure wish you had done things a little differently. Does this sound like a crazy analogy? It’s not as crazy as it sounds as this is what happens when companies implement new ERP systems – but don’t plan for how the new software will change their businesses. This lack of planning leads to three mistakes that cause companies to lose out on obtaining the full value from a new ERP system. Processes that involve how you manage your workflows are often put in place to deal with software limitations: the old software didn’t let you conduct business your way, so you had to compensate for it. A certain process becomes embedded into your organization, and over time, people forget why it was implemented. It becomes a sacred cow. Then, when new software is installed, the old process comes along with it – and often people are against changing it – even though it was based on the old software and its limitations. So things stay the same – and the new software, which was designed to make the company more efficient, is not being used to its maximum potential. Mapping your business processes and then programming your system to them before Go Live is the same as hanging your art before you move into your new home. When this happens, companies stay stuck in old workflows that keep inefficiencies in place. Once your new system is live – and you’ve used it for a while – you will have a whole new set of needs and workflows. With your new system comes a different mapping of your business, and yes, some people will have new work tasks and others will have fewer or different work tasks. Once a new system is live, many companies believe they’re done. Like the cash- and time-strapped home owner used in the analogy above, companies don’t want to put any more money into their system, or invest in training, or take time to analyze and streamline workflows. This leads to frustration – and the feeling you’re stuck with something that isn’t working for you. Which processes do we need and why? Why do we have this specific process? Should we keep it, improve it or chuck it and start over? Budget for post Go Live training and programming – While pre-Go Live training is essential, once the system is up and running, additional training will help your employees go to the next level – which in turn, streamlines workflows and maximizes ROI. In addition, budgeting for post Go Live programming ensures you get what you really want out of your system versus being stuck with something that doesn’t work. Align efficiencies with your organization’s goals – A whole other post unto itself, your business processes should support your business goals, whether they’re to grow revenues, improve productivity or decrease inaccuracies. One book I highly recommend you read is The Goal: A Process of Ongoing Improvement by Elihayu M. Goldratt. Now in its third edition, The Goal, which is a business book disguised as a novel, shows you how to focus on one goal and then look for potential solutions to problems that prevent you from reaching your goal. Do you have questions about how you can get more value out of your ERP system? Leave them in the comments section – I’m happy to answer them. Did you know that Crystal Reports, the popular report writing tool, was developed in the 1990s by Mark Cunningham and Terry Cunningham? The duo couldn’t find a suitable report writer for their accounting software, so they developed their own. Yep, it’s true. Crystal Reports (which has changed hands several times and is now owned by SAP), makes it very easy to extract data from complex systems, such as ERP and accounting software, and format it into easy-to-read reports. In fact, we use it to develop reports for InOrder. Easy to use, eliminates rekeying! One thing we’ve focused on in recent years is designing the InOrder interface so that CSRs can easily use it. This “keep it simple” focus extends to users across your company – which is why InOrder comes with over 200 installed reports. Just click and print! When software users can’t obtain the data they need in the format they want, they’ll often resort to creating customized spreadsheets in Excel. The problem? Lots of wasted time, duplication of effort – and errors due to rekeying. With InOrder, you can view your report on your screen, print it, save it as another format, or even export it to Excel. 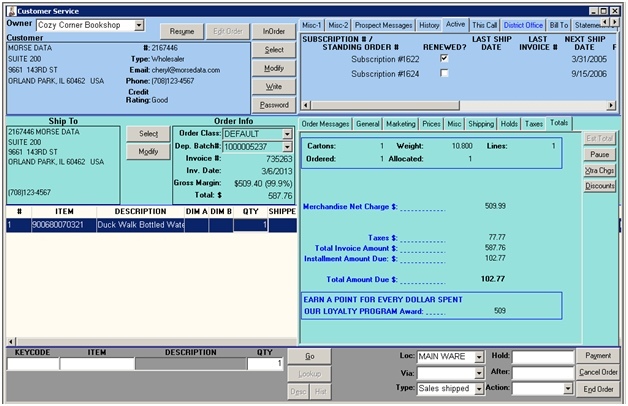 InOrder reports are flexible and provide a variety of parameters to choose. 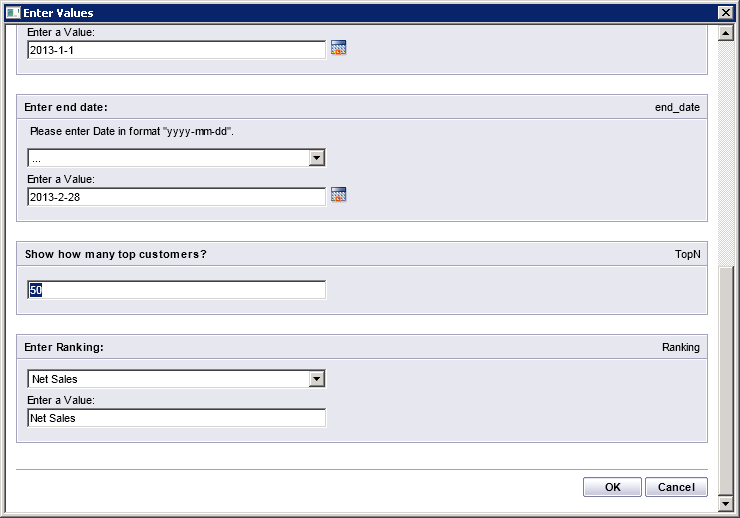 Or, you can customize any existing InOrder report using Crystal Reports and then save it for future use. What kinds of custom reports have you created? What do you like best about InOrder’s Reports? Leave your comments below.